In this reality series, Chef Gordon Ramsay travels to troubled restaurants to help their owners from having to close their doors for the last time. Working with a restaurant’s staff, the Chef has one week to take the restaurant from failing to fabulous. Each episode features a different restaurant and a different set of problems and Ramsay helps restaurant owners diagnose just what is keeping their establishments from success. He encounters such issues as uncooperative staff members, stubborn chefs, frozen food, dirty kitchens, and overly complex menus. While Chef Ramsay isn’t quite as volatile as he is on Hell’s Kitchen, he does take a tough love approach to helping business owners and chefs to change the error of their ways. 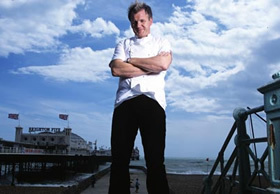 Love him or loathe him, Ramsay is passionate about the food industry and demonstrates that he wants those who share that passions to thrive. Kitchen Nightmares: FOX Reality Show Renewed for Season Three? Really? LOL. LOAD. DON’T YOU MEAN LOUD. Nightmares with Chef Ramsey is great and I love watching the BBC channel. My problem is with the swearing, it’s throughout the show, so many beeps it sometimes difficult to keep up with the story line.